My mother in law makes Russian 'tvorog' all the time, but I can't digest it because it is made from regular, store-bought milk with antibiotics, hormones, etc. Once we started buying real raw milk over a month ago, I decided I had to make some myself. I used this recipe from Natasha and slightly adapted it. She calls for buttermilk, but I didn't want to buy it especially for this purpose so I decided to just use organic yogurt and it worked beautifully. The directions look intimidating at first, but trust me, it's a lot easier than it looks! It's a really hands-off process! You know me, I don't like complicated recipes. I sighed when I read the directions. But once you try it, you'll realize how easy it is - you really just leave it to prepare itself. If you're home all day, it doesn't matter when you start it, but if you are home evenings, make sure you'll be home 24 hours from the time you place it in a warm room. It's not going to explode if you do plus or minus an hour or two. I found that techinically, you can just do day 1 and 2 if you see that the cheese is already separated from the whey, you can skip day 3 and get right down to business. Feel free to ask any questions if I missed something here! I highly recommend using a flour sack towel instead of cheesecloth, they also have many uses and are easy to wash. Cheesecloth tends to be disposable, but flour sack towels will last you for years! You get your money's worth and then some. My next attempt will be making yogurt and/or kefir because it seems my skin doesn't do as well with farmer's cheese or raw milk straight up! 1. Day 1: Allow ingredients to come to room temperature on the counter (6-7 hours). 3. Remove from oven and place in warm room or near a heat source (I put it a couple of feet in front of our space heater. Let sit for 24 hours until it becomes the consistency of sweetened condensed milk. Stick a spoon straight in and pull it out, it should lift up but not stick to the spoon. Do not stir. 4. Day 2: Place on stove on low heat for 40 minutes or until warm. Do not stir. Heat up slowly, otherwise you'll destroy all the benefits of raw milk. If you're making this with pasteurized milk then it doesn't matter as much. 6. Day 3: Place on stove on low heat for 40 minutes or until warm. 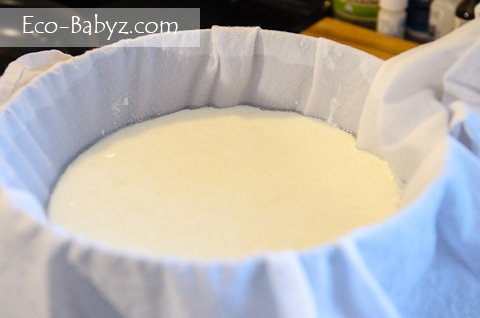 The cheese will separate from the whey. 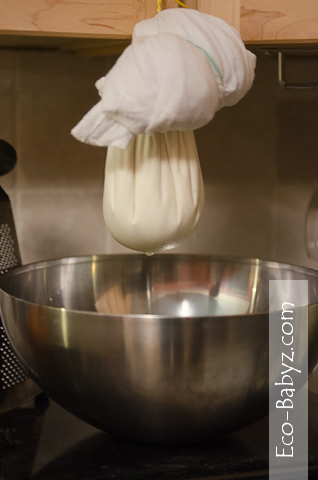 Pour mixture over the cheesecloth or flour sack towel and tie the top. Let it hang over a bowl for about 12 hours to drain (I attached mine to a cabinet handle!) OR place between two cutting board with a weight on top to drain out excess liquid. 7. To make the dessert in photo above, whip some heavy whipping cream (I used the real cream from the top of the raw milk!) 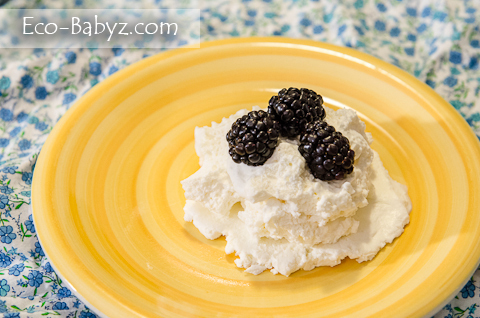 with honey, smother on top of a handful of farmer's cheese, and top with berries of your choice! Absolutely delicious.